Transitioning to ELN (electronic lab notebooks)? Let us help! Guaranteed attention to detail; our scanning captures every page, and we include a second quality check and re-count of each page. The Boston Computer Scanning (Bosscan) guarantee is "if you can see it on the original, you'll be able to see it on the scanned image." Let us help your migration to ELN's today! Increase productivity by allowing colleagues to share and collaborate with scanned PDF pages from their original notebooks. Now you can submit data faster, for timely approval and quicker development of your product. 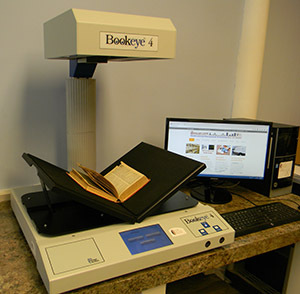 Contact Bosscan today and inquire about our high quality, low cost scanning at our office in Wakefield, MA. We also offer onsite scanning! We work with biotech, scientific research, life science, R&D, pharmaceutical, and medical device manufacturers. In addition to notebook scanning, we also scan files, charts, and 3-ring binder style books. Each page is visually verified against each scanned image twice; once during scanning, and once during post processing QC. All data captured up to edge of page and center spine. Quality and attention to detail; ensures light pencil, colored ink, and photos/graphs appear as clear as the original documents. Pages scanned in correct, original order. Your notebooks are secure whether scanning is performed “on-site” or at our facility. Images are deleted and scrubbed from BCS systems via governement grade data scrubbing incineration software after customer verifies receipt of images. 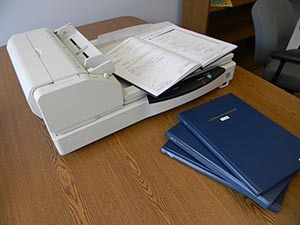 Are your documents and scientific notebooks used frequently or too sensitive to leave your office to be scanned? We will scan your documents on-site at your facility and scrub our disk drives of any trace of your data upon the completion and delivery of the project.